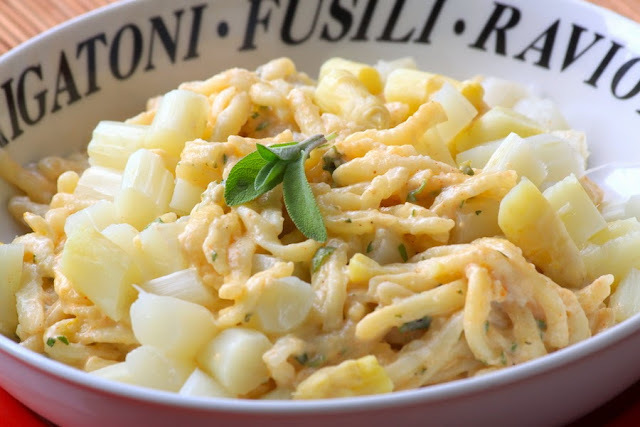 Here's an easy pasta dish, perfect for those lazy or busy days. It can't possibly go wrong. Feel free to adapt the amounts to your own taste. Sage is one of my favorite herbs, so I tend to add a lot of it to my pasta dishes. If you are less of a sage-lover, you can surely use less of it. 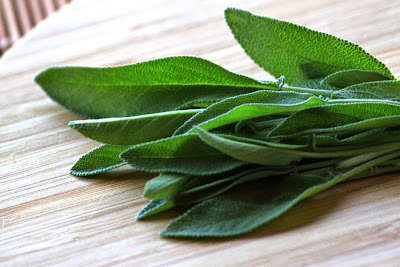 Also if using dried sage instead of fresh, you might need to reduce the amounts. Add some and taste it, just to be sure how much it pleases your tastebuds. Peel the asparagus with a peeler. Cut them into small pieces and cook with enough water to cover them. I added one large bay leaf to the cooking water for extra taste. Cook them in a covered pan over medium-low fire until soft. Cook the pasta according to the instructions in the package (until cooked to your taste). Drain it and bring it back to the pan. Add the coconut milk, spices, salt, lemon zest, sage and the cooked asparagus. If the coconut is creamy enough you might consider adding the asparagus together with the rest of its cooking water. If the whole thing is too runny, you may adapt it by adding some arrowroot and cooking the whole thing for 2 extra minutes until the desired consistency. If you buy your coconut milk at a shop that sells a lot of it, it will be always fresh and therefore it will not have the typical dominant "coconut" taste. It will work like a thick neutral nutty cream. Avoid coconut creams that contain flavourings, as it will certainly interfere in the taste.